Work caught up with me before I finished a post, so until I do finish it, a little something for your entertainment and edification. 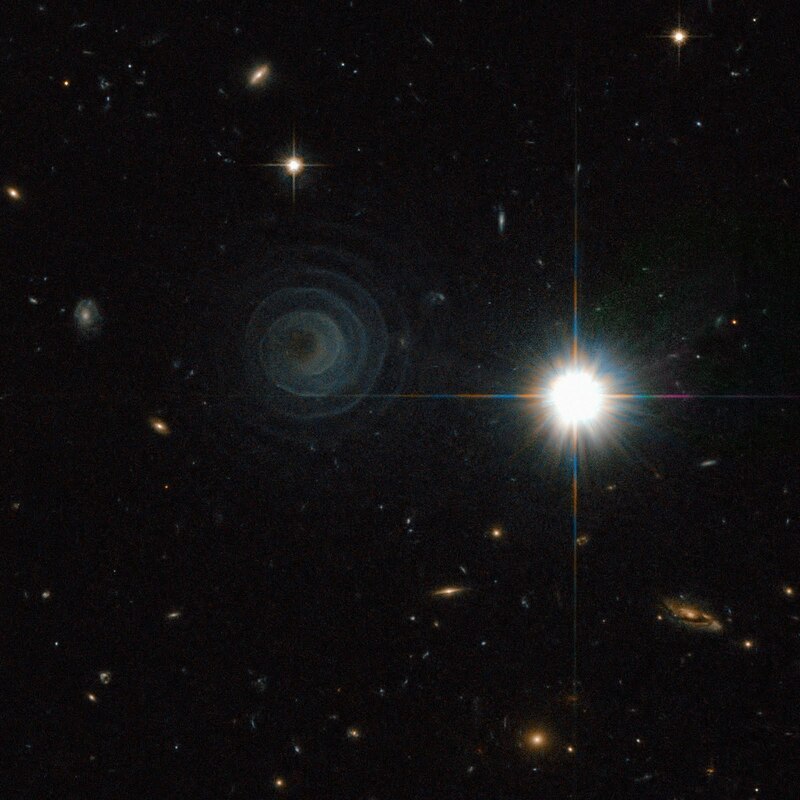 Via Astronomy Picture of the Day comes this Hubble image (click to embiggen), not a galaxy but a star 3000 light years away, LL Pegasi, more precisely a binary star. The cause of the spiral is uncertain, but according to Sky & Telescope it may be the swan dance of the seven veils, to mix some metaphors, by a dying red giant star that is shedding its outer layers on its way to becoming a white dwarf. The outer layers will in due course light up as a planetary nebula, but for now they are being spun off in a stream, forming an Archimedean spiral. The spacing between streams, 800 years, corresponds to the binary motion of the dying star and its companion. It all sounds vaguely torrid. Feel free to use the comments as an open thread. Ask, and ye shall (sometimes) receive: A reader emailed asking me to discuss future ground war. This I will take a bit more broadly as warfare fought on habitable, shirtsleeves planets, including sea and air operations. Warfare on non-habitable planets is an ambiguous case, with features of boarding operations in space. I intended to deal first with the space context. But y'all want grunts, preferably in power armor, supported by coolific armored vehicles and aircraft, with subs and trimaran assault cruisers out to sea. Which brings us to something that has not been tested yet. What happens when post industrial forces fight each other? We don't know, but we have seen this movie before, in flickery black and white a hundred years ago. Industrial age Western armies had shown how well they could scythe down waves of natives, usually. The general prognosis was that 1900-modern weapons were so accurate and effective that when turned on each other they would pretty much wipe each other out, and quickly. The Next War would be a come-as-you-are war, settled in months if not weeks by whoever ran out of arms and ammo first, if it weren't won a week earlier by strategy and tactical execution. 1870 was the prelude; 1861-65 merely an example of a semi-modern war fought entirely by blundering amateurs. It did not work out that way in 1914, so I hesitate to say it would work out that way now, or in 2114. What might happen, in fact, is broadly what happened in 1914: Everyone goes to ground. The general principle of future surface war, it seems to me, is that if you are caught out in the open you are headed for the celestial choir. This goes for guerillas, it goes for power armor troops, it goes for laser armed tanks, trimaran cruisers, aircraft, and spacecraft in low orbit. Give precision weapons a clear target and they will take it out. 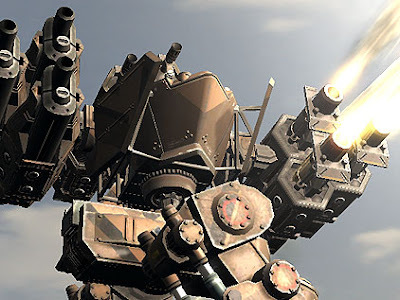 Thirty meter mecha, sad to say, make for very clear targets. Reconnaissance robotics, on the other hand, will be hard to take out. They can be very small and stealthy, making the Predator look like a B-36. So you should have plenty of scouts, including a robotic fly on the wall of the other side's headquarters. Your intel problem is noise - the more raw intel, the more noise. Any AI good enough to cut through it is an intelligence officer, not a piece of equipment. A tank backed into the underbrush is still effective, because it is hard to find, and you may only find it when it opens up on you. A tank on the move has a target painted on it. This, I think, is the real advantage of power armor troops: Compared to tanks they are stealthy, and can slip through environments where a tank would draw attention and fire. I expect power armor to be relatively light. At minimum you want enough to stop small arms fire, shrapnel, and the like. The maximum of useful armor is reached when a hit would kill you anyway, like getting hit by the equivalent of a truck. Against lasers this may mean the point at which you cook inside your armor, not good. Future war may well be 'slow,' because the mobility of power armor troops is essentially foot mobility, with enhancements like powered roller skates. Mobility is limited behind the front as well, because truck convoys will be conspicuous targets even hundreds of km behind the lines. Logistics too will have to be stealthy. It is easier to have a Ho Chi Minh Trail in the jungle, so one thing timeless will be the supreme importance of ground and the physical ecosystem. This of course gets interesting on habitable planets other than Earth. Some kinds of fortifications might remain valid, basically because dirt absorbs a lot of damage points. Yes, there are bunker busters and Thor bolts, but the point is that such big powerful weapons are costly to deploy, carried by vulnerable platforms, and can be engaged by defensive fire. This could be the saving of large naval surface combatants, hard to sink except by massive attack that overwhelms their defenses. The one way to achieve rapid, heavy movement, whether logistic or an actual assault, is to ramp up the noise level so high that the enemy's sensors are saturated, and nothing (you hope) is in 'plain sight.' If you are right you get blitzkrieg; if wrong you get the Somme. Large scale surface war may thus have an alternating rhythm - weeks or months of stalking, skulking, and skirmishes along the front, interrupted by episodes of sheer rock & roll, perhaps to cover the fast movement of a truck convoy up to the front, where it will disperse itself and go to ground. All of this takes place, or doesn't, against the background of nuclear weapons. The constraints on mobility in 'conventional' warfare could make it indecisive enough for the great powers to engage in it without risking a nuclear exchange. As in the 18th century they would be fighting for provinces, not national survival. Now for the space context. If suitable planets are limited - say, Earth and terraformed Mars or Venus - politically balkanized planets are to be expected, unless you go mid 20th century retro and have the American Empire a Federation. Certainly on Earth itself you can plausibly expect Great Powers, with great power militaries. 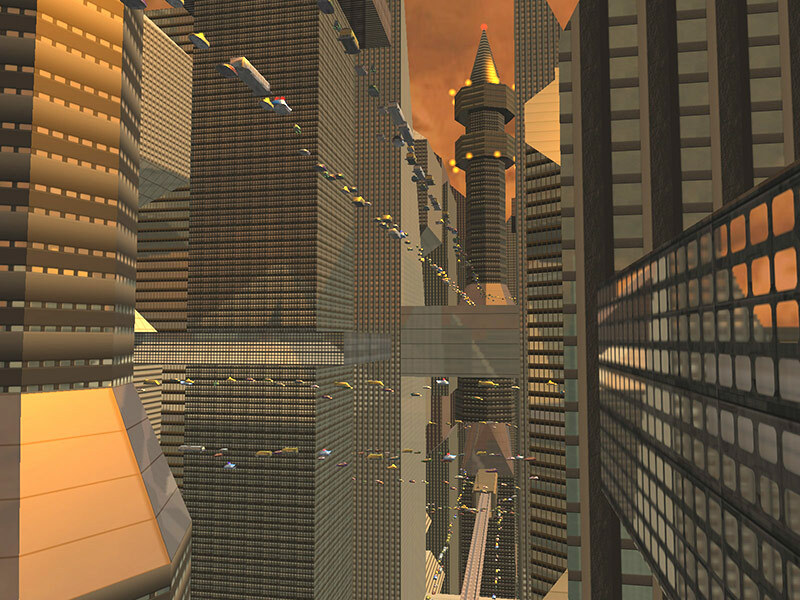 In a few-worlds setting, space itself will be off in the background. India is not going to get in a major tussle with Olympus Mons; both have bigger problems much closer to home. And India and China are not going to take their arguments to the asteroid belt, at least not in a big way, because money spent on deep space forces comes out of much more critical surface, air, and Earth orbital forces. This can have advantages for space-centric settings, because you can let the major Earth powers stalemate each other, keeping them off the deep space chessboard. In the classic operatic setting of many colony worlds, it could be a different matter. Uniform planets are rightly bashed, and I've bashed them myself. But in such a setting I think politically unified planets will be common, perhaps the norm. In the colonization era everyone can have their own planet, and later on, even if local fissures develop - and they will - any planet that can present a united front enjoys a huge advantage in interstellar power politics. Or putting it another way, any planet that cannot present a united front is at a huge disadvantage, drawing plot complications like flies. And here we are. I could make the many and salient arguments for peace, but I know they would fall on deaf ears, so we'll go straight to comments. The image comes from this futurist blog. In the future we will have handheld devices that resemble an iPad, except that they are not beholden to either Steve Jobs or AT&T. And we will want to know the Mars travel schedule right now, whether or not we can afford a ticket. To prepare for this future I have started playing around with the Java language and the Android operating system. I've written a number of sim programs in C, some of which are on my static website, but they all have a neolithic user interface that makes them impressively user-hostile. So I have decided to move into the 21st century and play with some sim apps that don't go out of their way to be inconvenient. Learning to program for mobile devices is a bit odd when I don't even own one, but the alternative was learning either Java for Windows, if there is such a thing, or programming inside a browser, which also seemed odd. Android provides a definite environment, and the Eclipse development tool comes with a nifty Android emulator, which you see in the screenshot. Because working with modern user interfaces is new to me, that has been the focus of my initial efforts, which you see above. Don't go rushing out to buy an Android phone just yet; as space game apps go this one is both unrealistic and boring. You type in a heading in degrees (on the slide out keyboard, not shown). 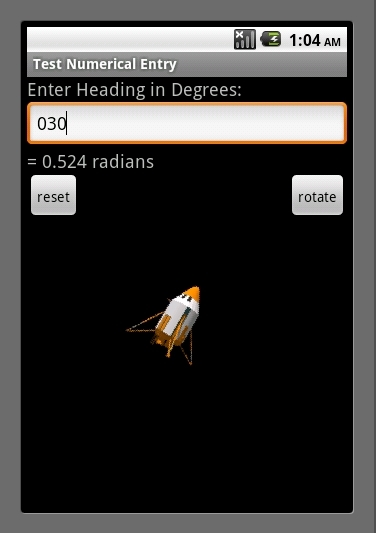 When you hit ENTER it reports the heading in radians, and positions the spacecraft at the desired angle. The little graphic comes with a Lunar Lander game at the Android development pages. Hit the Reset button to clear the entry. Hit the Rotate button and the ship does a 360 degree rotation (at a steady rate, no fancy acceleration and deceleration). Error entries - anything non-numerical - cause the image of a wrecked ship to appear. That is the entire functionality of the app. But the odd thing about a space sim app is that the rocket science is in many ways the easiest part. You don't actually have to design the hardware, after all, and as for the computations, Sir Isaac Newton and the computer processor do the heavy lifting. Providing the information in a way humans can play with it is the more challenging part. This little gizmo is effectively a sort of 'Hello, World' test of basic interface tools, and giving me a first sense of Java code in action. 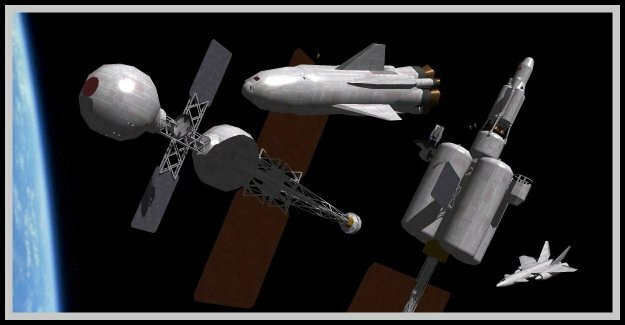 What I have in mind for now is a solar orbit sim, intended to test the performance of the sorts of midfuture ships that I discuss on this blog. Right now there are no tools out there (that I know of) for modeling steep, fast orbits, and my estimates of travel times are a mix of flat-space approximations and sheer guesswork. The interface, as I picture it, will toggle between a 'pilot' view roughly like this one, and a 'navigation' view showing the orbits. There will also have to be a design-phase screen for entering ship characteristics. It probably won't challenge FarmVille in the game popularity rankings, but who would have guessed that a farming sim would be a hit? And it will give everyone an opportunity to miss your destination and hurtle on to oblivion, without fuel enough to slow down let alone return to Earth. Good clean fun for all!